I just received yet another acceptance letter for one of my dialogues. This time the story is Viagra for a Pariah, and it’s appearing in the upcoming issue of The Green Light. A Lover’s Dwelling is coming out in the Flash Fiction Addiction anthology in the near future. 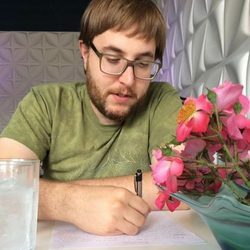 The third dialogue I wrote, Everything in It’s Right Place, is appearing in the Iowa’s Emerging Writers anthology, which you can pre-order on this website. I think it’s just amazing that all these small presses are taking on my words, telling their readers that this thing I wrote is worth reading. That means a lot. The piece I wrote this week is titled The Ghost of Yesteryear. It’s about a young man whose recently deceased father tells him to continue his love of nostalgia. You can find a list of all the dialogues (plus a list of all the published dialogues, and links if available, here).